The Life Essentials Study Bible is a study Bible that focuses on application of Biblical principles. 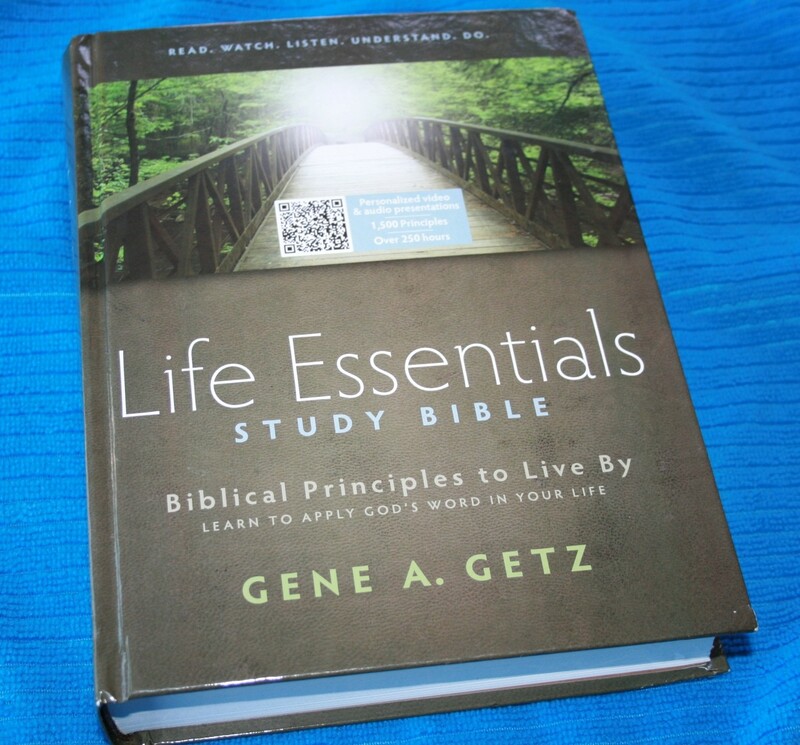 Rather than being filled with commentary on Biblical passages, it contains a wealth of information from Dr. Gene Getz on life principles from God’s Word and how those principles apply to our daily lives. The edition I’m reviewing is hard cover. Just from my observation is looks like it’s glued in sections. Time will tell, but it seems sturdy and well-made. It didn’t have any problems staying open anywhere I put it. The paper is about a medium opacity. There is more show-though than I’d like. 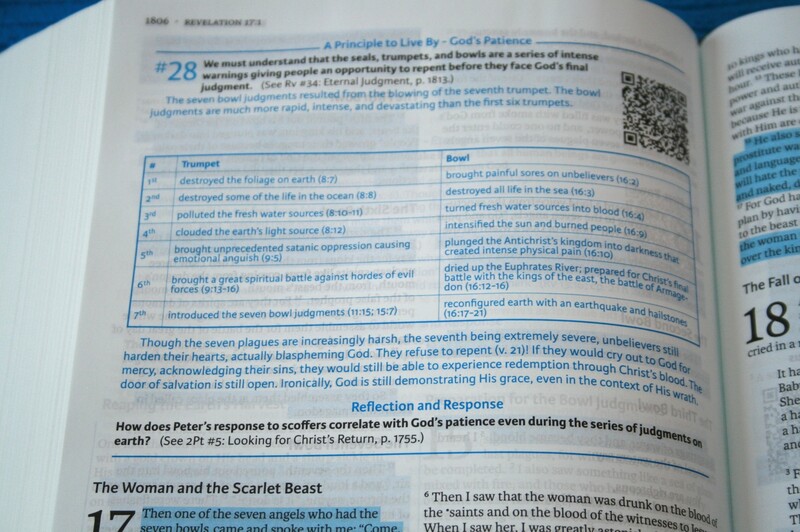 It gets distracting on pages with QR codes and lots of blue highlighting. I’m just guessing at the font size, but to me it looks like around 9-point with maybe a 10.5 leading. Again, that’s just a guess. I could be completely wrong. The font is modern and very readable. The blue print is not my favorite to read. I think it’s mainly that I’m not used to blue print. It does stand out. The text is in double-column, paragraph format with poetry set in verse format. The layout is much different from a commentary Bible where the text appears at the top of the page and the commentary at the bottom. Instead, the layout follows the format of text then principle. This keeps the principles as close to the text as possible. It also makes it difficult to find the verses you’re looking for, but if you use it for what it’s meant to be used for then it works just fine. 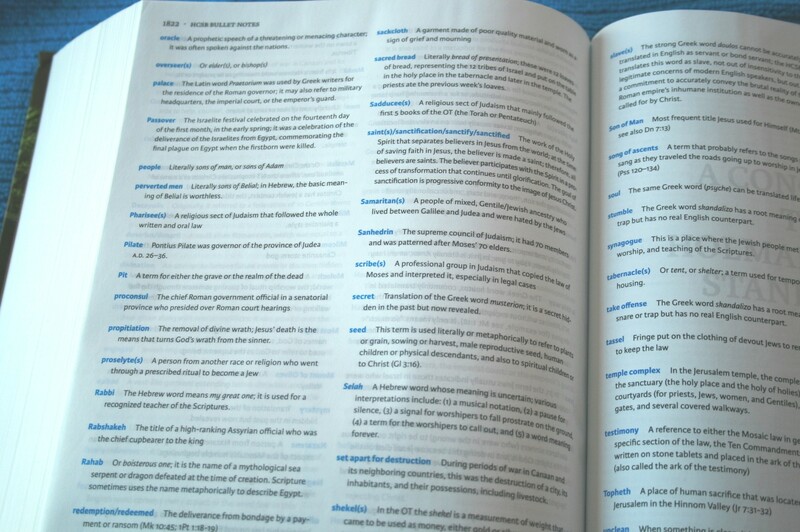 The HCSB text includes section headings and footnotes. The section headings are in bold. They are large print and really stand out. The footnotes, which include translation notes from Hebrew and Greek manuscripts, appear under the column of text they apply to. They are keyed to the text with small letters in blue. There are 1500 principles taught by Dr. Gene Getz. 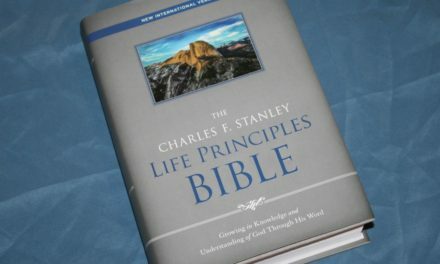 The principles include many topics such as abortion, witnessing, sin, selfishness, wisdom, leadership, marriage, love, motives, loyalty, persecution, perseverance, praise, prayer, and too many more to list. The topics are major topics that all Christians face, so they are very applicable. The principles appear under the passage they refer to and take both columns of text. This ends up making a random break in the text. There are several sections for the principle. First is a title. Next is a large number. This number is the number of principle in that book of the Bible. Then there is a summary statement for the principle printed in bold. Next is the teaching of the principle. These are usually several paragraphs and take from 1/3 to 1/5 of the page. 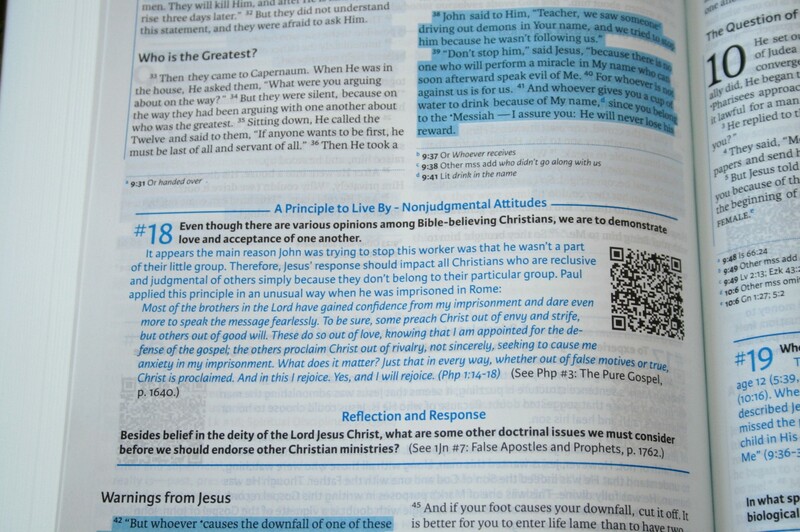 On the right side of this text is a QR code, which can be scanned by a smartphone. The codes take you to videos where Dr. Getz is teaching about that specific principle. The videos play on the smartphone. Next is a reflection and response. This is a question designed to make you think deeper about applying the principle to your own life. 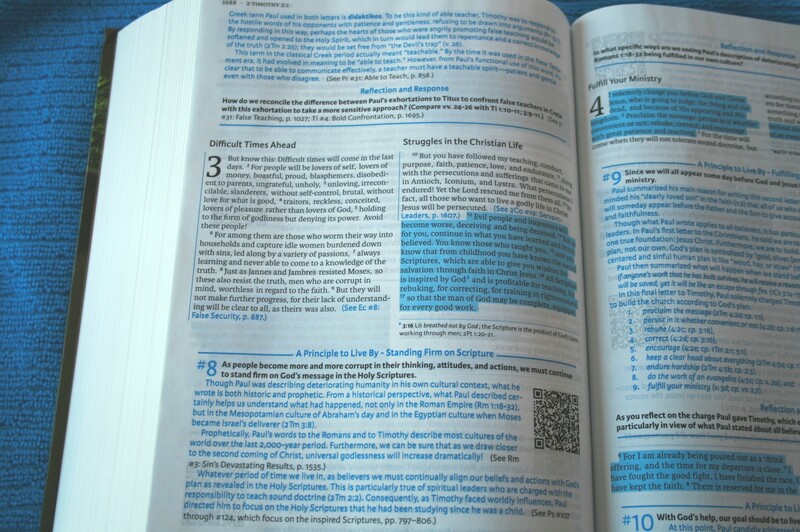 The most important verses for the principle are highlighted in blue. This makes it easy to know quickly which portions of Scripture goes along with the teaching. This is a little distracting, but it does help to identify the text quickly. Some of the principles are cross referenced to each other. The references appear within the principles and within the verses. 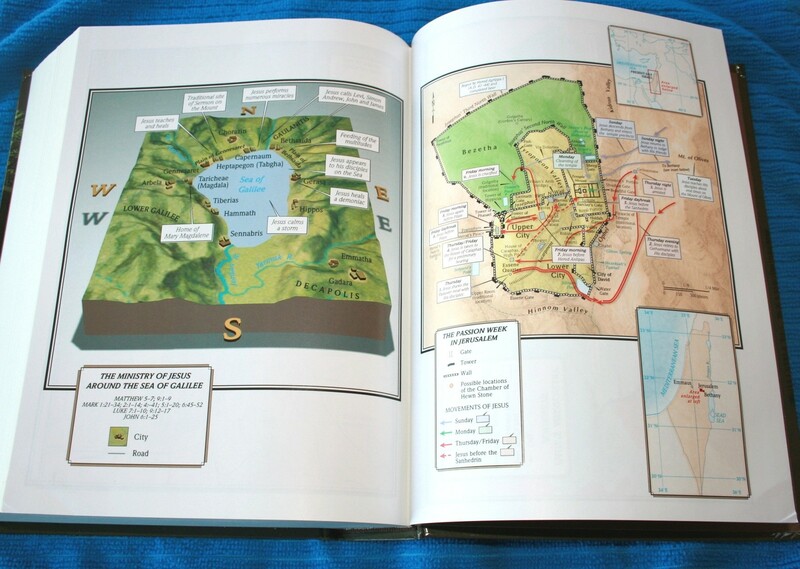 The references show the book name, principle number, principle name, and page number. The videos can also be watched on the accompanying website. 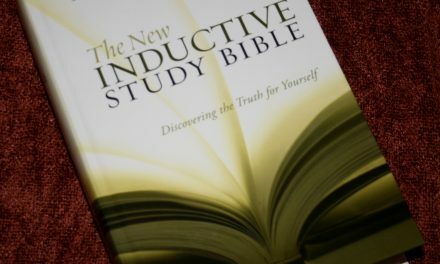 Go to the site (http://www.mystudybible.com/le) and select the HCSB tab. The videos for the section you’re reading will appear in the video player on the right of the screen. The videos are also available on youtube. Most videos range from 7-15 minutes with the average being around 10 minutes. 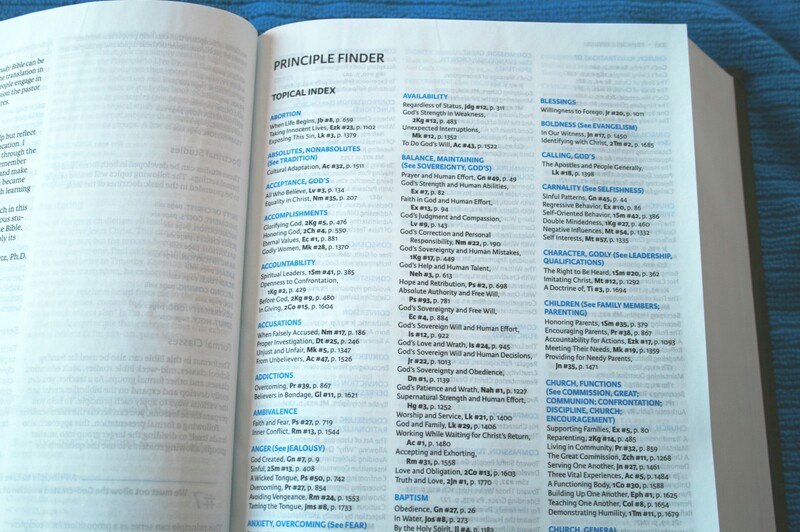 At the beginning of the Bible is an 11 page topical index called Principle Finder. This is an index to each of the principles in the study Bible. The listings include the topic name, the principle name, the book name, the principle number in that book, and the page number. 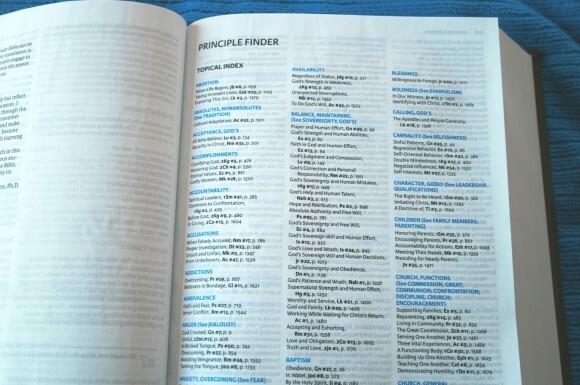 The index makes finding the principles easy. There are two major sections to the book introductions. 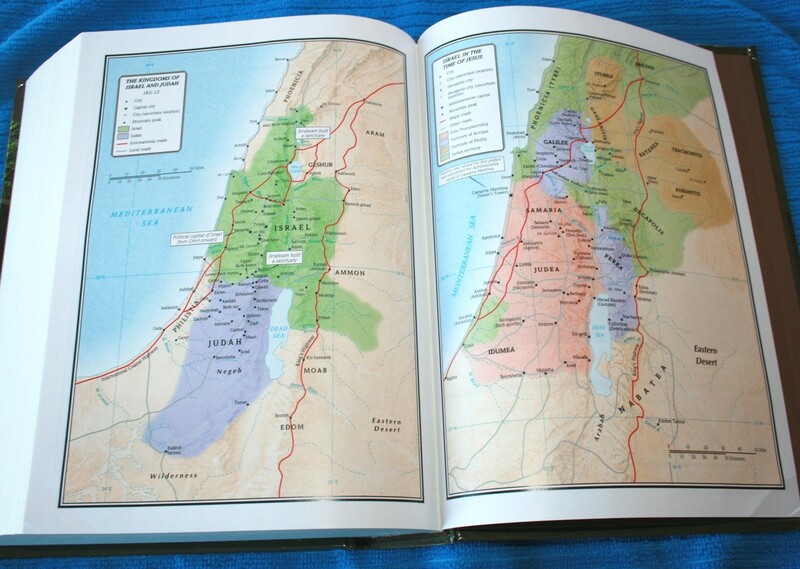 The first is the basic information that includes the author’s name and date of writing. Then there’s an introduction that includes a simple summary of the book and a few of the concepts in the book. 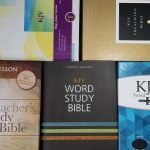 For multiple books (for example, 1 and 2 Timothy) they are combined. 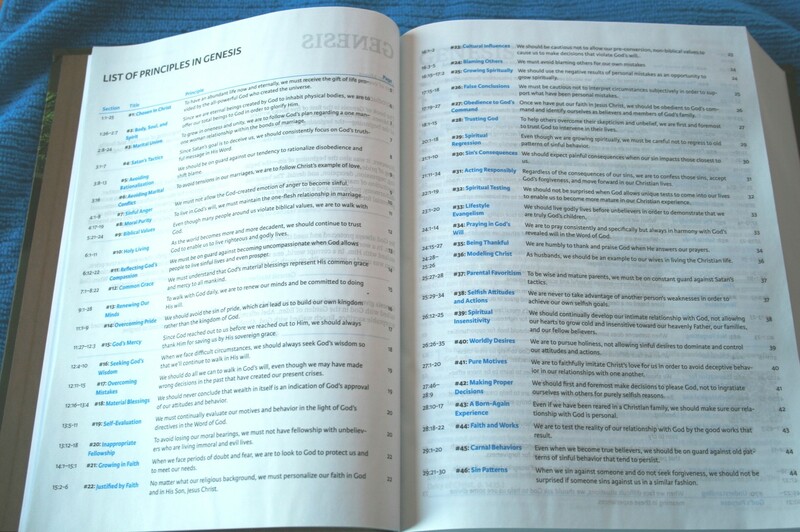 The next section is a list of principles in the book. This is a list of every principle with the chapter and verses, principle name, a sentence explaining the principle, and a page number. 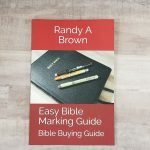 This is basically an index to the principles in that book and is a valuable resource when searching for principles and topics of study for any book of the Bible. To try this Bible out I wanted to study about standing on God’s Word. Out of curiosity I went to 2 Tim 3:16 to see what was there. I saw that verse was highlighted in blue, so I knew there was a corresponding principle. If I wanted to find the principle by using the topical index, I would have looked for ‘Scripture’ and saw what interested me. The principle talks about standing firm on Scripture. Dr. Getz talks about the deterioration of the culture of Paul’s day, giving Biblical references to several points including the Roman Empire, the Mesopotamian culture of Abraham’s day, and the Egyptian culture of Moses’ day. 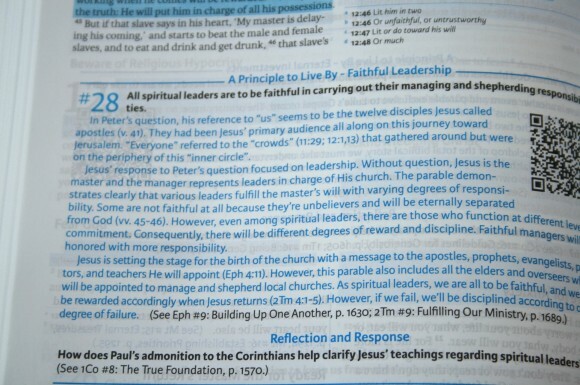 For this section there is a cross reference to another principle called Sin’s Devastating Results. Dr. Getz makes several points about how this principle still applies to us today and how our beliefs must align with the Word of God. He talks about the importance of spiritual leaders and their responsibility to teach sound doctrine. 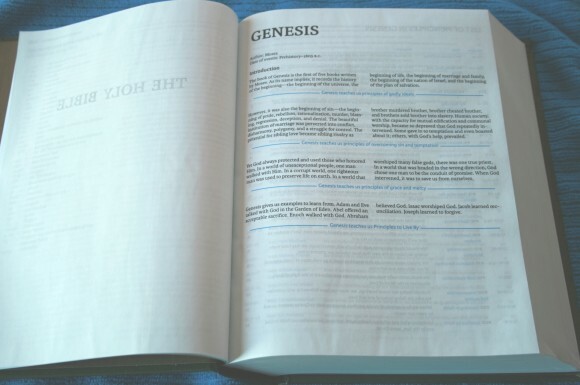 This section has a cross reference to a principle that focuses on the inspired Scriptures. The reflection asks for a comparison of the deterioration in Paul’s day, specifically 2 Tim 3:1-9 and Rom 1:18-32, with our own culture. I can see how this principle can easily be used in personal study, group study, sermon prep, Sunday school, any classroom setting, etc. Using these principles is a great way to kickstart your own personal study and can easily be used as a guide for teachers and preachers. 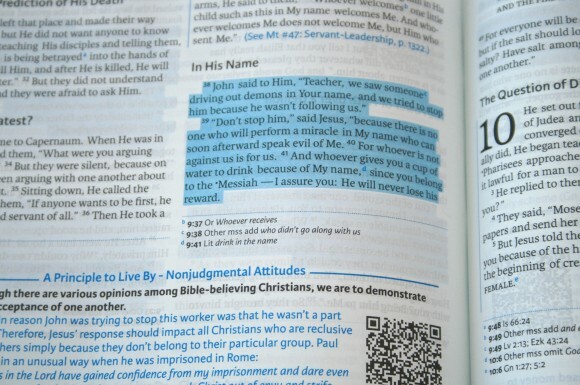 For more information I went to the accompanying website (http://www.mystudybible.com/le) and typed 2 Tim 3:16 in the search box. It automatically went to the video titled “Standing Firm on Scripture”. This video lasts about 7 minutes and goes into even more detail. These videos are already free online, but the QR codes make them easier to access from a smartphone. This edition includes the HCSB bullet notes in the back. These notes explain frequently used words. If a bullet appears next to a word in the Bible, it will also appear in this section with a definition or explanation. The bullet notes section is 5 pages and serves as a glossary. 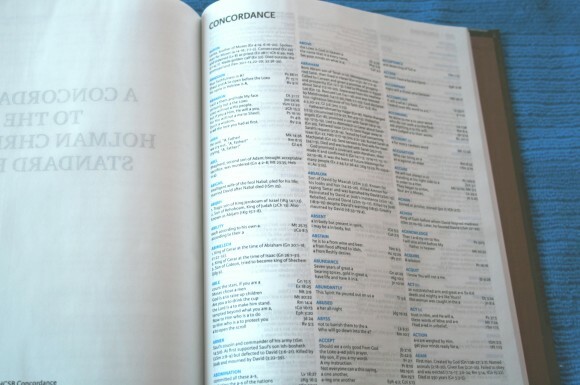 The concordance is 42 pages. The text is in three columns. There are 13 entries for ‘God’. 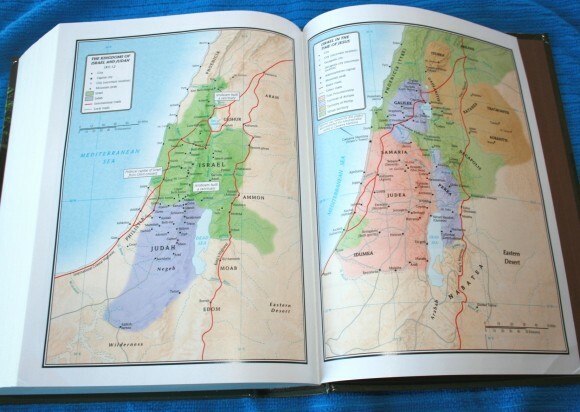 There are 8 full color maps. They look great. They are colorful and very detailed. One thing I would like to see added is an index to maps. This would make the maps much easier to use. 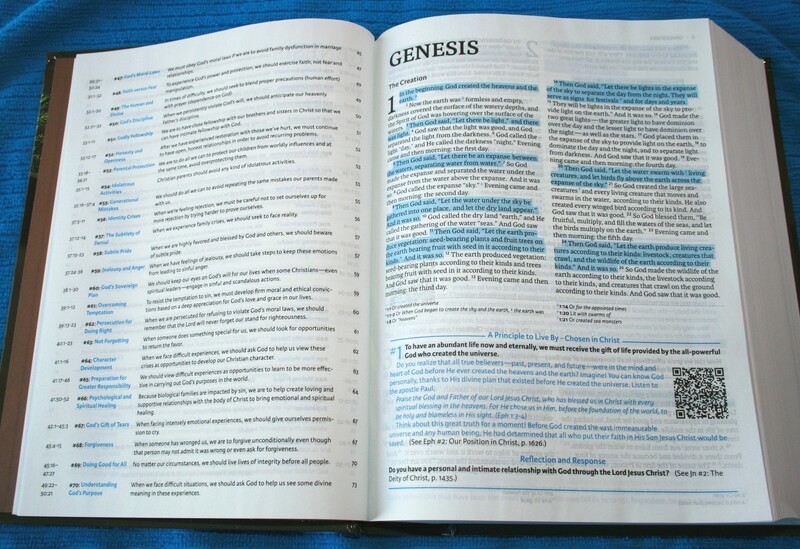 This Bible is filled with valuable teachings on life principles from God’s Word. 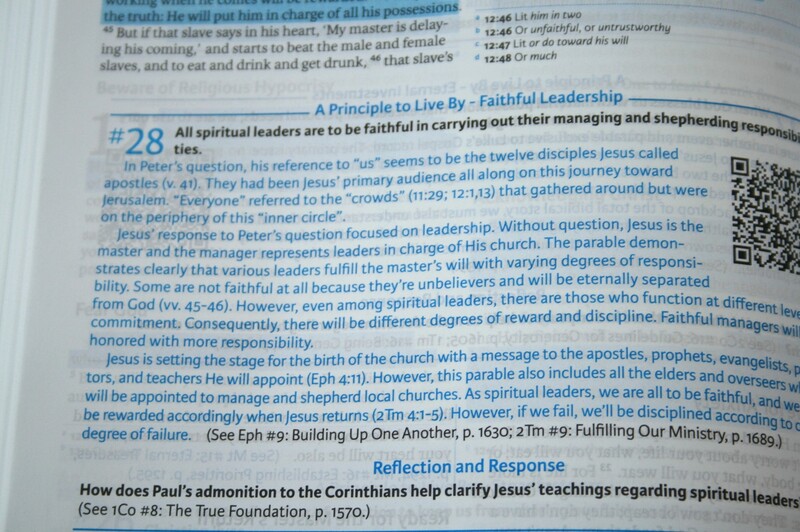 The principles can be used for personal devotional studies, group studies, or preparation from teaching or preaching. The topical index makes it easy to find specific principles for when you need information from the Bible to help you through something or deal with a situation. The 250 hours of accompanying videos can be watched from a smartphone, from the accompanying website, or from youtube. It’s not the prettiest Bible- the show-through, the blue print, and the distracting QR codes make it difficult to read for a long period of time. 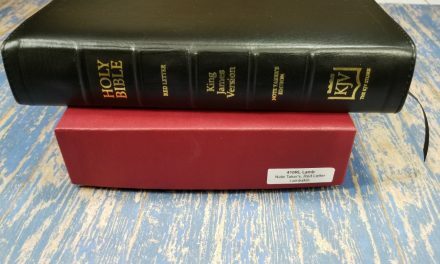 The layout makes it difficult to find specific verses quickly, but finding principles are easy by using the topical index or the indexes for the individual books. 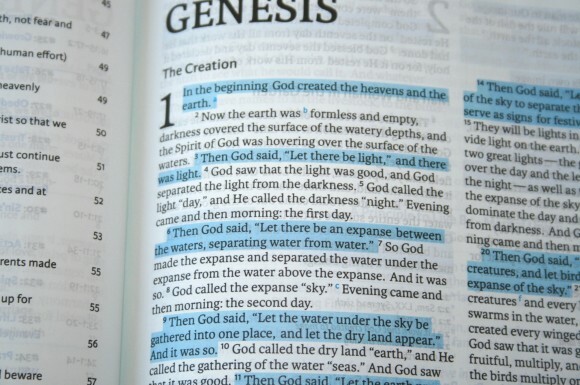 I felt like this Bible placed function over aesthetics- but that’s OK. It serves its purpose well. I highly recommend the HCSB Life Essentials Study Bible by Dr. Gene Getz. 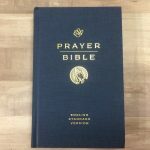 Holman Publishers provided this Bible free for review. I was not required to give a positive review- only an honest review.